It sounds impossible, completely impractical and quite frankly, too difficult. After giving this recipe the same criticism, I gave it a shot…and then fell completely in love. Even if you have never made a yeast bread please try this and share your results. I’d love to hear what you think! A close friend of my parents, John Fitzpatrick, introduced to me this Cooks Illustrated recipe. 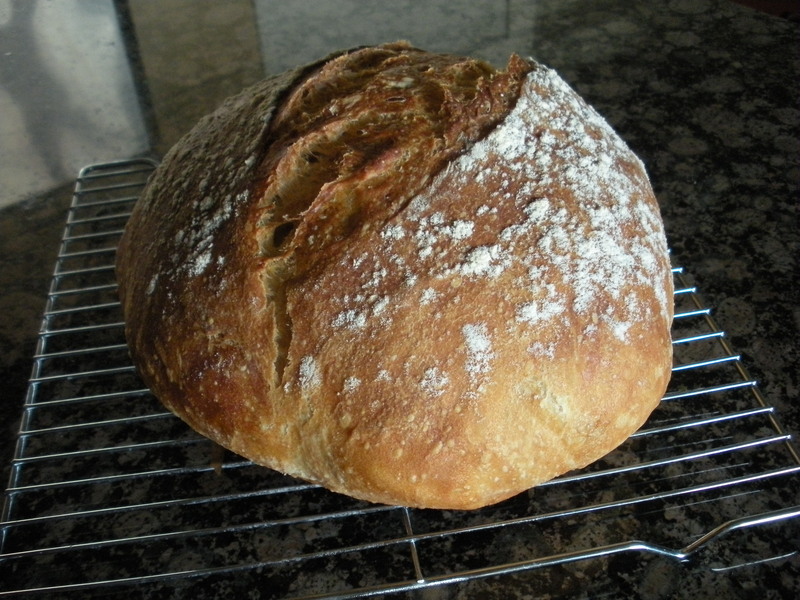 John is a passionate bread maker and I trust his recipes, I know you will too. 1/4 c. + 2 T. beer (fl. 3 oz.) room temp. Lay a large sheet of parchment in a 10 in. skillet pan and spray the paper with cooking spray. Transfer the dough to a lightly floured work surface and knead 15 times. Shape the dough into a ball by cupping your hands at the top of the ball and pulling it toward you, repeat 3 – 5 times to shape the ball. Spray the dough lightly with cooking spray. Cover loosely with the plastic wrap and let it rise at room temp for 2 hours or until the dough does not spring back when poked with a finger. About 30 minutes before baking, adjust the oven rack to the lowest position, place a large dutch oven with the lid on the rack, and preheat the oven to 500 degrees. When the bread is done rising lightly flour the top, then using a sharp nife score the top with a 6 inch long slit about 1/2 inch deep. Remove the pot from the oven and remove the lid. Lift the parchment and dough into the pot, let the excess parchment hang over the edge. Cover the pot and place in the oven. Reduce the temp to 425 degrees and bake covered for 30 minutes. Remove the cover and bake 20 – 30 minutes longer or until the bread is a deep brown color. Remove the bread from the pot and let cool at room temp for 2 hours.